Award winning designer Jill Nunemaker received her ATA in Landscape Design from Edmonds Community College. Her career in landscape design evolved as a natural progression, combining her years as a fine artist with her love of gardening. 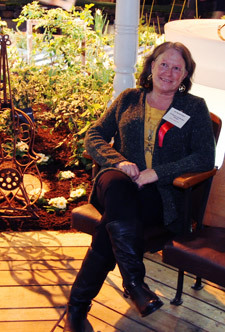 She has been a designer for display gardens at the Northwest Flower and Garden Show for three consecutive years. In 2010 her garden, “No Place Like Home” won the Bronze Medal, in 2011 “Alice in Wonderland” won the Bronze Medal, and in 2012 “Pictures at a Northwest Exhibition, Rhapsody in Green” won a Bronze Medal as well as the 425 Editor’s Choice Award and the Dahlia Award, for most creative and attainable garden. Jill’s training and work experience in the field gives her a hands-on understanding of the many aspects of the business, from design and costing to installation and maintenance. Jill Nunemaker is also an active member of her community. She has volunteered for many years in public schools with a primary focus on teaching art and gardening. She feels that volunteering is essential to understanding the needs of both the individual and the community at large. Her background in fine arts, with a Bachelor of Fine Arts degree, combined with her experience as a set designer and painter in theatre reinforces her ability to envision her designs in three dimensions and from different viewpoints. Her horticultural knowledge adds a fourth dimension of time and season. Living in Europe for 3 years and traveling extensively has opened up Jill’s vision to the many possibilities of exciting design beyond the expected.